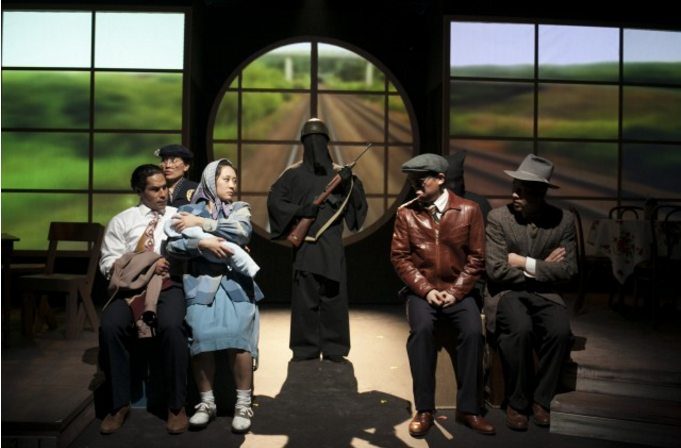 Lakin Valdez (Benjamin Montaño), Christina Chu (Hana Yamaguchi), Melanie Arii Mah (Thelma “Teruko” Yamaguchi), Rafael Toribio (Kurogo), Anthony Chan (Calvin Sakamoto), and Ryan Takemiya (Joe “Yoshi” Yamaguchi) in the world premiere of “Valley of the Heart,” presented in partnership by San Jose Stage Company and El Teatro Campesino. SAN JOSE — San Jose Stage Company, in partnership with El Teatro Campesino, is presenting “Valley of the Heart: A Kabuki Corrido” through March 13 at The Stage, 490 S. 1st St. in San Jose. Opening in the days leading up to Pearl Harbor, the Yamaguchis and the Montaños are two immigrant families struggling to provide a future for their American-born children after the Great Depression. The families’ oldest children, Benjamin (Lakin Valdez) and Teruko/Thelma (Melanie Arii Mah), fall in love and the emotional stakes are further heightened when the Japanese attack Hawaii on Dec. 7, 1941, throwing both families into uncertainty. Issues of loyalty and patriotism provoke both rebellion and heroism among young, imprisoned Japanese Americans while both Teruko and Benjamin fight to maintain their dignity, identity, family, and love in the face of war, fear, and separation. The cast includes Randall Nakano, Christina Chu, Gustavo Mellado, Rosa Maria Escalante, Anthony Chan, Endres Ortiz, Christy Sandoval and Ryan Takemiya. Born to migrant farmworkers and regarded as the father of Chicano theater in the U.S., Luis Valdez is best known for his play “Zoot Suit,’’ his movie “La Bamba,” and his creation of El Teatro Campesino, where he serves as artistic director. Thursday, Feb. 18, at 7:30 p.m.
Sunday, Feb. 21, at 2 p.m.
Wednesday, Feb. 24, at 7:30 p.m.
Thursday, Feb. 25, at 7:30 p.m.
Friday, Feb. 26, at 8 p.m.
Saturday, Feb. 27, at 8 p.m.
Wednesday, March 2, at 7:30 p.m.
Thursday, March 3, at 7:30 p.m.
Friday, March 4, at 8 p.m.
Saturday, March 5, at 8 p.m.
Wednesday, March 9, at 7:30 p.m.
Friday, March 11, at 8 p.m.
Saturday, March 12, at 2 p.m. and 8 p.m.
For more information, call (408) 283-7142 or visit www.thestage.org.